A place where I sell my illustrations and textile silk-screen prints online in my Etsy and Folksy shops. The above images are photos that i've taken for the shops, mixed in with press received for Beetroot press. If you'd like to take a peek at my shops, heres the link for my Folksy shop, and much the same, heres my Etsy shop too. I also have a Beetroot Press Facebook page, just follow the link here. I love screen printing, I specialised in Printed textiles at university, and it wasn't until 10 years after leaving that I set up at home to print my illustrations onto products I made by hand. I use my bathroom as dark room to create the screens, then print on top of the kitchen table. I use water-based inks on fabrics such as linen or organic cotton. 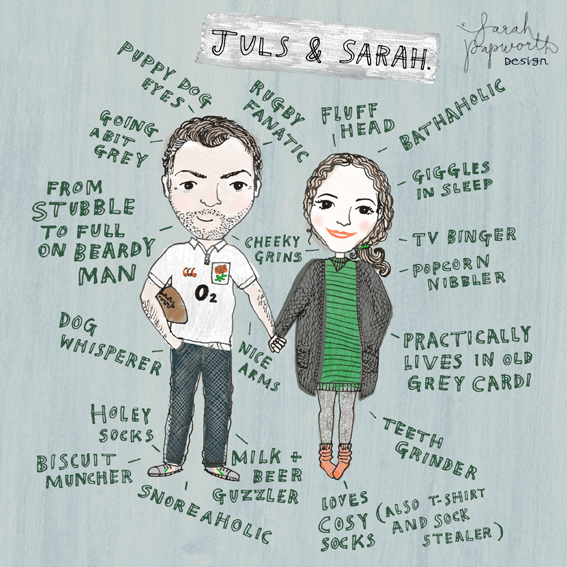 I've started to create more portraits for wedding invites and for special gifts. If you are interested in me creating something unique for you, please get in touch and we can discuss your needs, and what you'd love to see.